June 10th – Well it seemed almost impossible to top the Col d’Iseran but the famous Galibier did just that. This is a legendary climb and at 2,640 meters is just lower than Col d’Iseran and will feature again in ths years Tour de France. We drove up Galibier from the East side through the most beautiful valley. The climb is relentless but the last 8 or so kms are terrifying just to drive. Driving down the other side we saw loads of cyclists struggling up the west side. We drove down about 23 kms towards Briancon and parked the car. The first 15 kms from the car climbs to the Col du Lauterat – at 2,058 metres a super high pass in its own right. While not too steep, we had to ride into a stiff wind – yikes. 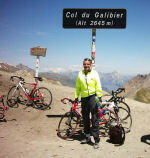 Doreen succeeded this climb while I set Galibier in my sites. From Lautaret it is 8kms to the top of Galibier. The road winds straight up a mountain and seems to go right over it. The last few kms are simple astounding. 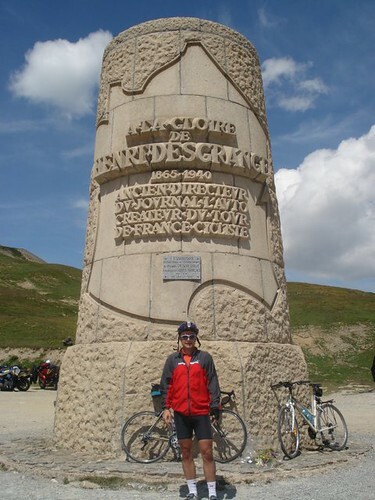 With about a km to go there is a monument to Henri Desgranges – unfortunately the dutch guy I asked to take the picture got his own thumb instead. Here there is a tunnel through the mountain for cars – while cyclist go straight up to the tiny overpass.